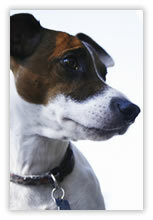 A two year old Jack Russell bought as a puppy. This amazing little Jack Russell was being very aggressive to his owners, he was nervous of passing cars when he was on a lead, barked frantically when anyone came into the door and jumped up at them and was possessive of his owners. The children’s friends were very wary of Jack when they came to play. He had bitten the owner’s daughter and had no recall. Two hours into the consultation, he was quiet, relaxed, didn’t run up the stairs in front of the children and had completely chilled out. Two weeks later when I drew up in the car he was lying on the front doorstep and didn’t even get up or bark. He quietly walked in the house after me, the owners thanked him and he went to lie down, he had even stopped pestering their cat. The children all love him now and I saw the owners walking Jack down a very busy main road just a few months after my first visit and the dog was walking happily beside his owner showing no sign of whizzing around or barking.